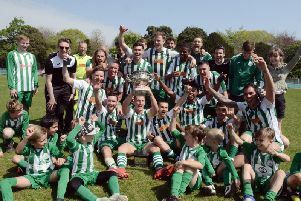 ‘Everything that could go wrong, did’ - that was the verdict of new Storrington manager James Everett after their opening day defeat to Wick on Saturday. Swans went down 2-1 after taking the lead at home in Division 1 on what proved to be a testing fixture for the home side. They were without 11 first team players by the time kick-off arrived and seven of starting 11 were not at the club last season. Despite this Everett, who took sole charge in the summer after being on the coaching staff last year, praised the commitment levels and felt they deserved at least a point. He said: “Coming into the game off the pitch everything that could go wrong did. “Already having eight first team squad players unavailable we lost another three in the morning of the game to injury and illness. “The was testing to the depth of the squad and leaving us with only one usable sub, which hampered us in the later stages of the game where players tired. “Despite the obvious setback the response from the players I had was remarkable given that we were forced into a change of formation and personnel. “The commitment levels shown on the pitch were a real positive in a performance that deserved us to at least share the points. Storrington went ahead after 19 minutes when Russell Shoebridge fired past Keelan Belcher, but Wick got a crucial leveller through David Crouch five minutes before the break. The turnaround was complete 17 minutes from time when substitute Guy Church deflected effort beat Gary Elliott in what turned out to be the winner. That came after Swans had two good chances in the second half, one of which was cleared off the line from Dave Francis. Storrington: Elliott, Hide, Clarke, Stideford, Bardouleau, Lucas, Cave, Gilmour, Shoebridge, Francis, Carter. Sub: Jarvie.